Israeli forces, including infantry and military bulldozers, raided the city of Ramallah early on Saturday, breaking into the Amari refugee camp to the south of the city, just after midnight. Hundreds of soldiers surrounded a building owned by the Abu Hmeid family, in the centre of the camp. Israeli forces claim that the family’s son, Islam, killed an Israeli soldier during a raid of the camp, in June. Palestinian activists and supporters had kept an around-the clock vigil near the building, to prevent its demolition, after Israeli courts had approved its destruction as a collective punishment measure against the family. The demonstrators were beaten and attacked with pepper spray by soldiers, and around 500 women men and children of all ages were removed, by force, to a football field nearby. The soldiers blew up the building by rigging the house with explosives, fully demolishing the house by 9:30 this morning, leaving a plot of rubble, which it is believed is intended for settlement building. Residents of the camp responded by throwing stones at the soldiers, who fired tear gas and stun grenades, causing dozens of injuries; at least 10 Palestinians were transferred to hospitals, according to the Palestinian Red Crescent. Medical and Press crews were also attacked in the raid, with one photographer hit by a tear gas canister in the head, and was hospitalized. “We will not fall down and we will not surrender, and my house is a sacrifice for Palestine and its people, and if the occupation destroys it, we will rebuild,” the mother of the family, Umm Nasser Abu Humaid, 72, told Palestine Television. The army had previously demolished the Abu Hmeid house twice, in 1994 and 2003, PNN further reports. Five of the family members, not including Islam, are serving time in prison for resisting the Israeli occupation; four are sentenced to multiple life terms, while another son was killed during a military operation against Israeli forces. The head of the wall and settlement resistance committee, Walid Assaf, announced on Saturday the formation of a national committee to rebuild the house. Assaf said: “We will begin to form a national committee to rebuild the house of the family of Abu Hamid as soon as possible and we will provide the family housing until it is reconstructed. 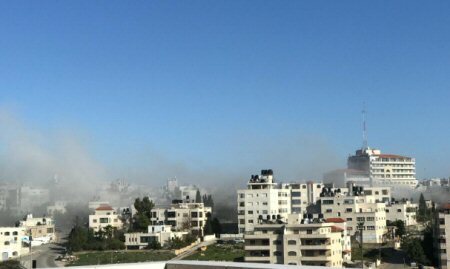 President Abbas is reportedly in conversation with Egyptian and Jordanian governments about the events taking place in Palestine, over the past week, and the violations of international law by Israeli forces which have occurred, calling for international action over the continuing situation.